We've had our Tesla Model X for just over 1 year now and it's been great. The X is my daily driver, we've taken it on multiple road trips, we've been through the desert in the summer, over mountain passes in the winter, through the heavy smoke of forest fires, and more. Thirteen thousand miles and it has spent a few days in the shop too. I'll tell you the good and the bad from my first year of Tesla ownership. May 2016 - Emailed my delivery specialist and asked for an ETA. He said we'd know more when the vehicle entered production. Aug 2016 - Changed the configuration to 6-seat. The change fee was waived since I was changing it from a configuration that was not currently in production to one that was. Our vehicle was in production by the end of the month. Sept 15th, the day I took delivery and where this story began. The online order process was great. I played around with a lot of options and you could easily see how it impacted the cost and payment. I opted for the big battery, tech package with the bio-hazard filter, carbon fiber décor, Autopilot, subzero weather package, and the towing package. During the months from ordering in February until our delivery in September, I'd email our delivery specialist each month and ask for an update or if the expected delivery date was known yet. Sometime during these months, our assigned delivery specialist left Tesla and my emails were not getting a response. Eventually, I received an email saying they'd left Tesla and a new delivery specialist was being assigned. The new delivery specialist failed to reply to my emails too. I complained and my case was escalated to a manager. I was not emailing them frequently, but I did expect a reply within 2 business days. The manager that took over my case was great. He was knowledgeable and responsive. Our new delivery specialist manager was the person that explained that the 5-seat config was not yet in production in July of 2016 and that we'd have to switch to 6 or 7-seat if we wanted the vehicle sooner. This is something that I wish was presented in the design studio when we configured the vehicle. It would have allowed me to make decisions based on the schedule as well as the cost. The good news is that Tesla seems to be doing this for the Model 3. When you select dual motor or the standard range battery pack, you can see the schedule impact this has on your estimated Model 3 delivery date. While we were waiting for the Model X, my wife had an idea. She suggested that we pick up the car at the factory in Fremont, CA. We could make a family vacation out of it. We'd fly there, take the factory tour, pick up our Tesla, go to Disneyland and then road trip home. I thought this was a great idea. It would be about 1,400 miles of driving and a great way to become familiar with the car. This was especially fitting my first EV had been a service vehicle at Disneyland before it came to me about 10 years before (I'll tell the story of my first EV another day). I contacted our delivery specialist and described our factory pick up and tour plan. He said that certainly was possible, but I should be aware that if I took delivery in California that I'd have to play the California state vehicle sale tax of 9%. "But I don't live in California," I protested. He said that it didn't matter. That was the state law. I looked into it and he was right. 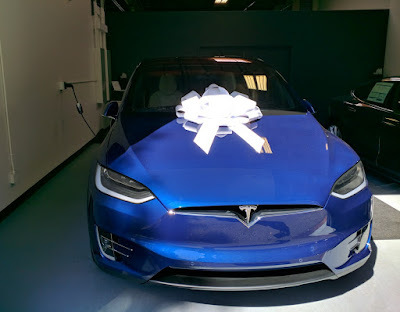 That was the California law and (according to the forums) many Tesla buyers like myself had scrapped plans to fly to the factory for delivery. So we stuck to the plan to take delivery at the Tigard service center near our home. On September 14th we received the email that the car was here and ready to be picked up. I made arrangements to pick it up the next day after work. At this time, due to one of our car's being totaled earlier in the year (again a story for another day), I was driving my old 1997 Honda Passport. On my way to work that morning, the low-fuel light came on. Since I was trading in the Passport that afternoon, I didn't see a reason to fill the tank, this would be the last day that I was driving it. I was not happy with the $800 trade-in price that I received for the vehicle, somehow filling in the tank seemed like it would only make this worse. This is petty, I know. It was ironic to be trading in such a cheap vehicle for such an expensive one. The trade-in value didn't even cover the delivery fee for the Tesla. And the fact that I wanted another $200 on my trade-in value would not impact the cost of the Tesla in any significant manner, but still, I was not going to trade it in with a full tank. So, here's a tip, don't expect a great trade-in value. If you want to maximize the value of your old car, sell it privately (but this can be more work and beware of scammers). Leaving work that afternoon, I hit traffic heading to the service center. The fuel light was on and had been on since that morning. I was not sure if I'd make it all the way to the service center. People talk about range anxiety related to EVs, I was in a gas-powered SUV and I had range anxiety worse than I'd ever had in an EV. I made it to the service center. I'd planned to bring my camera and take some "out with the old, in with the new" photos, but running off to work that morning I didn't grab it. Here's a quick shot from my phone of my new Tesla on delivery day. As a side note, the new Portland South Waterfront Service Center has a delivery center that has much better lighting for photos. I am not the type of person that names his car. However, going through the configuration for the car, it asks you to name it and this is how it would be referred to in the app too. So I wanted to come up with something fun, clever, and non-obvious. Nikola?, Lightning?, ... no, these are too obvious. 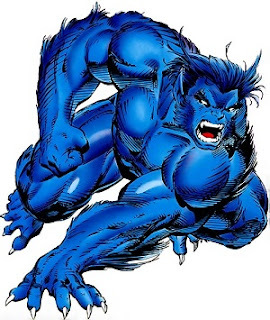 Mulling it over, I eventually settled on calling it Beast. Why Beast? Well, it's big, blue, strong, smart, and (wait for it) it's an X, man. I drove the X home and I loved it. It is the best vehicle that I've ever owned. I turned on Autopilot and watched the steering-wheel adjust to the curves and the vehicle slowdown on its own as we (Hank and I) approached the traffic in front of us. The big screen, the clear backup camera, falcon wing doors (FWD), easter eggs, this was a fun car. To be fair, this is the most expensive vehicle I've ever purchased and a comparison to any other vehicle that I've owned would very unfair to the other vehicles. So rather than a review of the vehicle, this will be the story of my ownership experience. You can find plenty of vehicle reviews if that's what you're looking for. Soon after I received my Model X, Tesla announced that they were updating the Autopilot hardware (more cameras, better ultrasonics, better video processing...) and that cars with the new system would eventually be able to drive with full level 5 autonomy. Wow, I had owned the vehicle less than a month and it was already outdated (or so it seemed). There were plenty of new owners in the same situation and many of them were upset that Tesla offered no ability to upgrade their vehicle. If the car didn't come with the hardware, retrofitting it was a near impossibility. As it has turned out (so far), Autopilot Hardware 2 (AP2) was not the promised panacea. Details came out later that Tesla and Mobileye had a falling out. So even though AP2 promises to eventually have far more capabilities than my AP1 system, Tesla has a lot of work to do before AP2 would be fully functional. And now, even a year later, AP1 is arguably still more the capable system. So while I know that soon AP2 will be the far more capable, at least I've had this one year of gloating rights. During the year that we owned this car, we put 13,000 miles on it. This is far more miles than I typically drive in a year. We drove to Grants Pass in the winter, the Painted Hills in the desert of eastern Oregon in the summer, we pulled our camper, went to Comic-Con in San Diego, to Crater Lake, the Oregon Caves, through a wildlife safari, to a butterfly pavilion, and to Thor's Well on the Oregon coast. It was a lot of fun and it was all fueled by free Superchargers and destination charging. 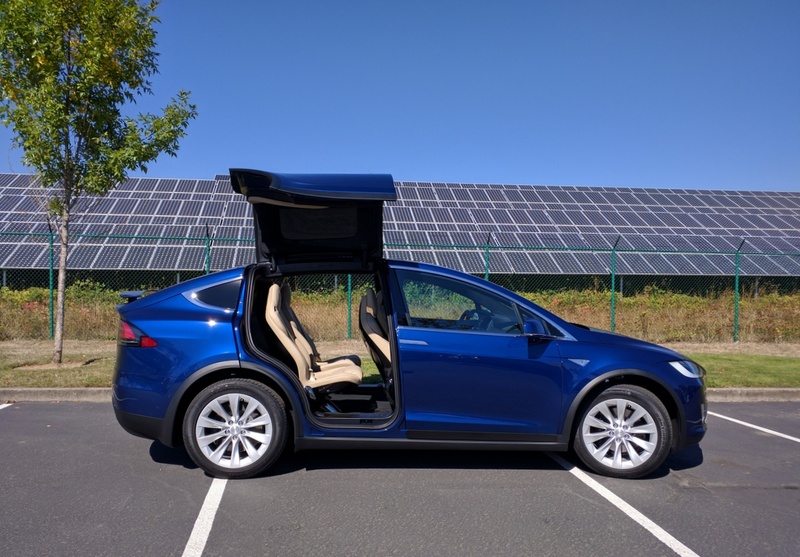 Comparing the Model X to similarly sized gas vehicles, I would have used more than 500 gallons of gas and spent more than $1300 to fuel my vehicle. Instead, the road trips used free Supercharging and my daily commutes were powered by overnight electricity rates of 4.5 cents per kilowatt-hour. So instead of spending $1300, I only spent about $200. I have recently started tracking the battery capacity of the Tesla, just as I've done in the Nissan Leaf we've owned since 2011. I'll have more to report next year when I've collected more data. It looks like the Tesla has lost 2% in the year that I've owned it. This is far better than the Leaf's first-year degradation performance. Degradation slows over time, so 2% in year one is awesome. The rear passenger-side window wasn't seated properly, it stuck out farther than it should. They replaced it. I was showing the car to a group of my coworkers, when one of the falcon wing doors was opening it made a loud pop and crack sound. A piece of plastic at one of the hinges had broken. One of the falcon-wing doors stopped working. I pushed the button to open it, it moved about 2 mm and then stopped. It wouldn't move. I called Tesla service, we tried a bunch of things. Eventually, a cold reboot (disconnecting the 12V battery) solved it. The car made a repeating clunk noise under medium acceleration when it was cold. They replaced a front half-shaft. The parking brake was recalled. This repair was done at my house. A mobile service ranger brought a service truck out and fixed it in my driveway. That is great service. The passenger side mirror stopped retracting after the ModelXmas easter egg display. A software update fixed this. For all of these repairs, they were covered under warranty and done in less than 2 days. Additionally, I was given a Tesla loaner car while mine was in the shop. Talking to other owners, I guess I was lucky in this regard in that they occasionally use non-Teslas for loaners. The folks at the service center here in Tigard (now Portland) are great and they even washed the car for me. After all those road trips, there were more than a few bugs plastered on the fascia that I know they weren't easy for them to remove. You might look at that list and think, wow that's a lot of issues for just one year. I don't mind if there are issues. I bought the first model year of a new vehicle from a bleeding edge company. My VIN is around 16,000, I expect issues. What matters more to me is how they deal with them. In every case the service center took my concerns seriously, they acted promptly, resolved the problem, and gave me a Tesla loaner. Which, in one case, meant that I got to drive a P100 Ludicrous vehicle for a day. I have no regrets, I would buy it again in a heartbeat.